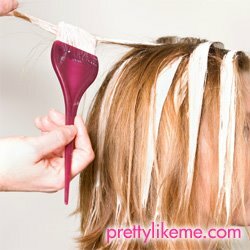 Baliage or Balayage, is a highlighting technique where powder bleach cream is painted directly onto clean, styled hair with a brush in small sections. It is widely favored because it creates very natural-looking highlights that grow out without developing a noticeable and obvious root. Hugely popular with models, starlets and famous beauties, Balayage has received a lot of attention in beauty and style magazines in recent year s due to it's popularity among Hollywood's A-List. Due to this increase in demand, many salons have decided to add balayage to their service menu. Many salons even tout "Master Colorists" that have a perfected Balayage technique, marketing them as artisans of the craft and luring a new client base to the salon. Balayage emerged as an innovative hair coloring technique in Paris in the 1970s. The word is French for “to sweep,” a reference to the way in which the color is applied. Hair is painted by hand with a brush using cream bleach as the medium. Applied in a sweeping process, the highlights are painted on by hand in root to the ends of the hair in small strands. The art of the Balayage technique is paint lightly at the root and heaver as you reach the ends. This creates a rich but natural highlight on hair that looks like hair was "bleached at the beach". As the hair grows, roots will be less obvious for the first eight weeks because a thinner amount of color is applied to the root. Performing balayage is no more time consuming that foil highlights. In fact, some skilled Baliage artisans can do a full head in about 2 hours. For more information about Balayage see this Basic Instructional Video.